Here are several ways to ensure the proper amount of fireproofing to help boost your levels of commercial fire protection. When you need to make sure your commercial building is safe, you need to make sure any hazards are accounted for. This includes the possibility of unexpected fire hazards. 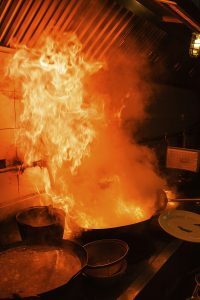 Here are several ways to ensure the proper amount of fireproofing to help boost your levels of commercial fire protection. One of the simplest steps to take is to keep all workspaces clean. Clear all trash, papers, and other debris from desks, chairs, and anywhere else that work happens, especially if they are near electrical outlets or candles. Commercial fire protection starts with constant vigilance. Winter can be bitterly cold, especially whenever the polar vortex comes to town. If your building has insufficient heating, or the heater needs to be upgraded, then your fire protection needs skyrocket. However, even with that said, you must monitor the heater so that it doesn’t become a problem. Your employees might also bring in their space heaters or heating pads to help keep warm. Make sure that these appliances are not too out of date or that their power cords are torn and frayed, as they can both ignite and cause another fire in the office. Inspect the kitchen or the break room – where the office microwave or stovetop could be kept. These areas can help your employees heat food that they bring for lunch, but they need to keep it clean. Grease fires and cooking tools being left all over the place can create another hazard whenever the burners or heating elements are left on; plus, some items shouldn’t be microwaved, no matter what. Inspecting the electrical systems of your commercial building is just as important as doing the same for residential properties. This can prevent power outages, flickers, and surges that can disrupt the workflow of your employees and endanger the office equipment they need to use. Plus, if your grid is out of date, it could be faulty. A short circuit could cause a fire when you least expect it. One last bit of advice is to set up charging stations for your employees. Here, they can charge smartphones, tablets, laptops, and wireless headphones without presenting a risk to anyone else in the office. This entry was posted on Friday, January 25th, 2019 at 3:15 pm. Both comments and pings are currently closed.